ICS Financial Systems Limited (ICSFS), the global software and services provider for banks and financial institutions, announced that it has been named a member of the “World Finance 100” in recognition of its excellence in the field of banking solutions. Each year World Finance compiles the list of 100 individuals and companies – not according to capitalization figures or growth, but purely on excellence in their field. Research undertaken by the team at World Finance, along with the finest insight from the magazine’s worldwide readership, has found the best names in critical markets around the globe, from financial services, technology and telecommunications to media, pharmaceuticals and healthcare. Perusing through the World Finance 100, which names those that have set new standards, introduced new opportunities to their markets and held steadfast their sustainability goals, readers will see that optimism is possible, even at times when we feel it least. “We are honored to have been selected for the World Finance 100. This kind of recognition proves that we are delivering on our promise to provide the bespoke state-of-the-art financial products and services, and best possible returns for our client’s technology investment achievable anywhere.” Mr Hazboun added; “Innovation is the key for banks to flourish in this digital era, that is why we provide our customers with the utmost advanced banking solutions and service offerings, to experience the true meaning of “one-stop shop”. “ICSFS Have been at the forefront of innovative Islamic and core banking software solutions for a number of years now. Their attention to detail and individual client requirements in a very fluid industry has meant that they can offer a range of services that will ensure the delivery of a first-class banking service”. World News Media is a leading publisher of quality financial and business magazines, enjoying a global distribution network that includes subscriber lists of the most prominent and senior decision-makers around the world. ICS BANKS provides a complete suite of banking modules with a rich sweep of functionalities and features, addressing business needs and automating accounting processes, as needed, to improve a bank’s business performance. ICS BANKS has always been a pioneer in utilizing the latest technology to serve financial institutions. In addition to its embedded Service-Oriented-Architecture (SOA), the system is deployed in a multi-tiered setup that runs on a web thin client. ICS Financial Systems Limited (ICSFS), the global software and services provider for banks and financial institutions, announced that BOND Savings & Loans Ltd., which was recently awarded the fastest growing brand in the Savings and Loans industry, has officially selected the awards-winning banking and financial solution ICS BANKS® to be implemented in its Headquarters and all its branches in Ghana. “We are delighted to be selected by BOND Savings & Loans, where it marks our second reference in Ghana. We are committed to deliver BOND our utmost advanced and developed financial services, in addition to the unlimited offerings and privileges that BOND will enjoy by choosing our Universal Banking Application ICS BANKS, BOND will also be able to compete in this digital era through our ICS BANKS SMB (Smart Mobile Banking) and ICS BANKS IBS (internet Banking System) and take advantage of our systems’ Omni-channel experience”. Hazboun added “We are looking forward to this partnership and have a vision of a wider bright future plan for ICSFS in the African continent”. ICS BANKS provides a complete suite of banking modules with a rich sweep of functionalities and features, addressing business needs and automating accounting processes, as needed, to improve a bank’s business performance. ICS BANKS has always been a pioneer in utilising the latest technology to serve financial institutions. In addition to its embedded Service-Oriented-Architecture (SOA), the system is deployed in a multi-tiered setup that runs on a web thin client. اعلنت شركة آي سي اس فايننشال سيستمز ICS Financial Systems Ltd. – (ICSFS) الرائدة في مجال أتمتة العمليات المصرفية لقطاع البنوك والمؤسسات المالية عن قيام بوند للإدخار والقروض باختيار النظام البنكي العالمي والمتطور الحائز على عدة جوائزICS BANKS® ليتم تطبيقه في كافة فروعه في غانا. “لطالما بحثنا عن الشريك التكنولوجي المتطور والمثالي ليساعدنا على تقديم المنتجات والخدمات المصرفية المصممة بالطرق المبتكرة لنتمكن من تقديم خدماتنا باعلى مستوى.لقد اخترنا شركة من بين العديد من الشركات الاخرى لسجلها العريق في افريقيا وسمعتها المعروفة في جميع انحاء العالم.” واشار السيد اوفشيون لاهمية هذه الشراكة قائلا:” ان السياسة التي نتبعها في بوند تتمحور حول رضا العملاء، ان شراكتنا مع ICSFS ستعكس مدى نجاحنا بتزويد عملائنا بخدمة مصرفية من الدرجة الاولى، وكذلك سيتمتعوا بخاصية (Omni-channel) من خلال قنواتنا المتكاملة. 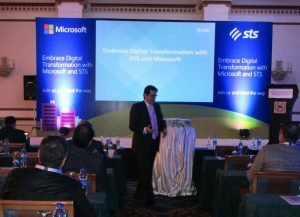 Specialized Technical Services (STS) held an “Embracing Digital Transformation” event in partnership with Microsoft, focusing on driving digital transformation within organizations to maximize a company’s potential. During the opening address, General Manager of STS in Saudi Arabia, Kamal Masri said “Technology plays a role in almost everything we do, and organizations are adopting digital solutions to help improve the daily lives of users. According to research, Digital Transformation is the single most important topic on the agenda of CXO’s as challenges relating to Digital Transformation are not only focused on geopolitical challenges. On the other hand, Mr. Masri emphasized on cyber-security being either the enabler or disabler for Digital Transformation while discussing how organizations should protect themselves from being vulnerable in order for them to reap the benefits provided form Digital Transformation. Dallah Hospital IT Operations Manager, Omar W. Hindas said: “Businesses in Saudi Arabia can benefit from Digital Transformation by remaining ahead of the curve when it comes to the latest digital trends. It was beneficial to learn more about how companies can utilize their agility to implement and experiment with the latest advancements in a faster and more effective way”. On his part, Al Faisaliah Group Holding JSC (C) Group CIO Suliman Khader claimed that “With millions of Internet users in the Arab world, we want companies to be at the forefront of digital innovation to provide users with the best possible experience. The event was a great forum to learn more about the latest Digital Transformation trends, best practices, and challenges. It also brought together a diverse group of businesses to collaborate and exchange insights”. عقدت شركة إس تي إس(STS) ، الشركة الرائدة في تقديم حلول نظم و تكنولوجيا المعلومات والإتصالات المتكاملة في المنطقة، بالتعاون مع شركة مايكروسوفت ندوةً تحت عنوان “تبني التحول الرقمي” لعملائها في المملكة العربية السعودية حيث تمحورت الندوة حول أهمية التحول الرقمي للمؤسسات والشركات لتحقيق أقصى الإمكانيات في مجالات أعمالها وقطاعاتها المختلفة. و في إفتتاح الندوة، عبر مدير عام شركة إس تي إس في السعودية السيد كمال المصري عن امتنانه للعملاء لشراكتهم طويلة الأمد مع الشركة وايمانهم بقدرات فريقها و أضاف قائلاً: “تلعب التكنولوجيا دوراً أساسياً في كافة نشاطاتنا حيث أن أغلب الشركات تتبنى أحدث الحلول الرقمية بهدف تسهيل حياة المستخدم اليومية. وبناءً على ما أكدته اخر الأبحاث، أن تبني التحول الرقمي هو أحد أهم القضايا التي تستحوذ على اهتمام كافة قادة تكنولوجيا المعلومات في المؤسسات من مختلف القطاعات حيث أن التحديات التي تواجه المؤسسات في هذا المجال لا تقتصر على التحديات الجيوسياسية فقط”. و إستكمل المصري الحديث بالحث على أهمية تجهيز وتدريب الكوادر البشرية حيث أن تقدم الشركات و نجاحها يكمن في مدى كفاءة كوادرها قائلاً “إن نجاح التحول الرقمي يعتمد على التعاون الفعال بين الأشخاص و الإجراءات و التكنولوجيا حيث أن التحول الرقمي هو عملية ينظر لها من ثلاثة أبواب: تحسين و تعزيز العمليات، و تعزيز عمليات إتخاذ القرارات، و الإبتكار في كافة الحلول و المنتجات و الخدمات المقدمة للمستخدم. و لفت المصري الإنتباه إلى قضية أمن وحماية المعلومات وما له من أهميته في تفعيل و ضمان إستمرارية التحول الرقمي، و استرسل مستعرضاً بعض التوجهات والحلول لمواجهة هذا التحدي التي تضمن حماية المؤسسات وأمن معلوماتها. وأضاف: “أن الندوة كانت بغاية الأهمية حيث أنها سلطت الضوء على إمكانية المؤسسات من الإستفادة من هذا التحول بتطبيق و إختبار و تبني الحلول التكنولوجية المتقدمة بشكل أسرع و بطريقة فعالة بما يخدم عملياتها”. 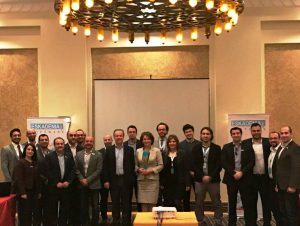 ESKADENIA Software, the leading Jordanian-based provider of world class software products & services conducted its 2017 Annual Strategy Meeting with the presence of the Company Management and Sales Teams to recap its strategic plan, goals and objectives. The meeting took place at The Movenpick – Dead Sea on the 12th of January 2017. ESKADENIA Software’s Strategy Meeting started by a presentation by the Managing & Executive Directors of the Company that reviewed the achievements of the previous year and the broad objectives of 2017. The Business Units Managers presented their objectives that included Financial, Products, Projects, Competence and Personal Targets for the current year and their strategies to achieve these objectives. All were guided by the Mission of the company to become a leading and global provider of World-Class Products, Services and Solutions that exceed customers’ expectations. A number of sessions were conducted to discuss and agree on a set of achievable yet aggressive objectives that each has responsible champion within ESKADENIA. The sessions were led by the ESKADENIA Software’s Department Managers who discussed the department’s objectives, requirements, plans and the methods to achieve the desired goals. 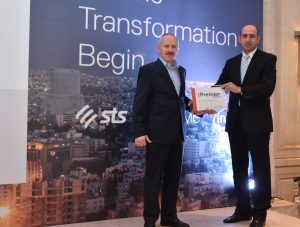 STS, the region’s leading Information Technology (IT) Solutions provider, has proudly announced the attainment of the first and only Dell EMC Premier Partnership in LEVANT. The milestone continues to prove STS’ leading pole position in the industry and signifies the company’s dedication and commitment towards its partners as they become the only company in LEVANT to attain this prestigious status. STS, with a cohort of immaculate IT experts, achieved the well-coveted Dell EMC Premier Partner status by completing all necessary certifications and achieving competency specialization requirements as requested and expected from Dell’s PartnerDirect Program. This level of partnership endorses and attests the exquisite service and superior execution which clients have grown to expect from STS. Striving to continue along the strategies of the past, this partnership will enable STS to offer more competitive prices; easing the path for businesses to adopt the latest technologies and further grow their operations. The announcement was made during one of STS’ periodic technology events, which was coordinated with Dell EMC in the presence of more than 150 Information Technology experts from different sectors. عمان- أعلنت شركة “إس تي إس”، الشركة الرائدة في تقديم حلول نظم المعلومات و تكنولوجيا المعلومات والاتصالات المتكاملة في الأردن والمنطقة عن تحقيقها أعلى تصنيف شريك أعمال لشركة “ديل إي إم سي” العالمية. هذا الإنجاز الفريد من نوعه يؤكد مكانة إس تي إس في مقدمة الشركات في القطاع كونها الشركة الأولى والوحيدة التي حققت هذا التصنيف في منطقة حوض المتوسط ضمن عدد قليل جداً من مجموعة شركاء “ديل إي إم سي” الحائزة على هذا التصنيف الرفيع، حيث حققت إس تي إس أعلى درجات التميز و الابتكار في تطبيق الحلول التقنية فضلاً عن تقديم الدعم الفني اللازم للعملاء من مختلف القطاعات. ويعد هذا الانجاز المتميز لشركة “إس تي إس” استمراراً لاستراتيجية الشركة بطرح أحدث الحلول التقنية العالمية للسوق العربي بأكمله بأعلى درجات الدعم الفني وباسعار منافسة. ويعد أيضاً شهادة تميز وخبرة فريدتين، كونها حققت جميع متطلبات الحصول على هذا التصنيف من شهادات تقنية متقدمة تضمن استمرارية العطاء على أوجه إستناداً على المعايير الرفيعة التي عودتنا عليها إس تي إس على مر السنين. وبهذه المناسبة، قال مدير عام العمليات في شركة “إس تي إس” حسام كتخدا: “نحن سعداء و فخورون بتحقيقنا هذا التصنيف المرموق كوننا أول وأعرق شريك أعمال لشركة “ديل إي إم سي” في المملكة حيث أننا أثبتنا على مدى 27 عاماً مدى جدارتنا في أن نكون خياراً موثوقاً للشركاء والعملاء، و الذي بدوره يعكس قوة كادرنا وحرصه الدائم على الحفاظ على أعلى درجات التعاون مع شركائنا لمواكبة متطلباتهم على أحسن شكل. و من جهته صرح المدير الاقليمي لشركة “ديل إي إم سي” لمنطقتي الأردن ولبنان محمد هلال قائلاً: “ان هذا الانجاز يتماشى مع تاريخ شركة “إس تي إس” الحافل والغني بالانجازات كونها أولى شركائنا في المملكة وكونها استمرت بالعمل والتطوير لتتميز عن غيرها بتقديم خدمات لا تضاهى لعملائها لتحظى بثقتهم الدائمة. وأضاف: “نحن بدورنا فخورون بهذه الشراكة الاستراتيجية بين شركة “ديل إي إم سي” و شركة “إس تي إس” وعلى ثقة تامة باستمرارية تطور “إس تي إس” وحفاظها على مكانتها المرموقة كشريك أعمال موثوق في السوق الأردني و العربي”. و من الجدير بالذكر أن الاعلان عن هذا الانجاز تم خلال افتتاح اخر فعاليات شركة “إس تي إس” الدورية بالتعاون مع شركة “ديل إي إم سي” و الذي حضره ما يزيد عن 150 مختص من كافة مجالات و قطاعات تكنولوجيا المعلومات. الشركات الأردنية الوطنية من تميز وعالمية . على كلا المستويين المحلي والاقليمي. دواكم أكبر سلسلة صيدليات في الأردن . ESKADENIA Software has been selected by Jerusalem Insurance Company Ltd (JERCO) to implement ESKA® Insures and ESKA® Business Manager. The contract, signed earlier this month, will deliver to JERCO state-of-the-art Insurance and Enterprise Management software. The fully integrated insurance package contracted by Jerusalem Insurance incorporates General Insurance, Medical Insurance, Life Insurance, Travel Insurance, Financial, Approval & Notifications and HR & Payroll Systems. ESKADENIA’s highly-efficient automated insurance system is designed specifically for insurers that will allow JERCO to provide prompt and responsive service for their wide base of customers in Jordan. All ESKADENIA Software products also offer a customer-oriented and project-oriented standard that extend real-time managerial support for all its implementations.